Presence is an intimate look at the development of a new theory about change and learning. In wide-ranging conversations held over a year and a half, organizational learning pioneers Peter Senge, C. Otto Scharmer, Joseph Jaworski, and Betty Sue Flowers explored the nature of transformational change--how it arises, and the fresh possibilities it offers a world dangerously out of balance. The book introduces the idea of "presence"--a concept borrowed from the natural world that the whole is entirely present in any of its parts--to the worlds of business, education, government, and leadership. Too often, the authors found, we remain stuck in old patterns of seeing and acting. By encouraging deeper levels of learning, we create an awareness of the larger whole, leading to actions that can help to shape its evolution and our future. Drawing on the wisdom and experience of 150 scientists, social leaders, and entrepreneurs, including Brian Arthur, Rupert Sheldrake, Buckminster Fuller, Lao Tzu, and Carl Jung, Presence is both revolutionary in its exploration and hopeful in its message. This astonishing and completely original work goes on to define the capabilities that underlie our ability to see, sense, and realize new possibilities--in ourselves, in our institutions and organizations, and in society itself. "A remarkable book, Presence is a journey from the present to an unknown future, a journey of exploration rather than dogma, and a journey toward a vision of humanity at its highest. Like a good documentary film, Presence is a book with 'emotional truth, ' a wonderful combination of intellectual and visceral experience." "At this turbulent juncture in human history, a whole new set of social innovations promises to shift humanity away from its destructive path towards a brighter planetary civilization. Presencing and its U process is one of the most profound. It provides all who want to change the world not only with profound hope, but with a systematic and effective way to birth a sustainable planetary society." "If you believe, as I do, that an organization is ultimately a human community, then nothing is more important than how we sense our future and act to create it together. This is something all creative business leaders know yet have found almost impossible to talk about--until Presence." 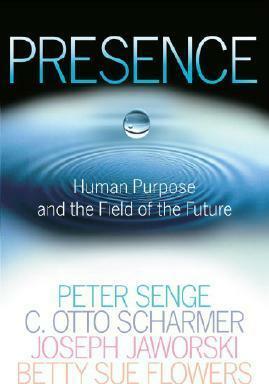 "Presence is a timely and altogether important book. Drawing on a leading-edge understanding of human learning and awareness, it offers a simple but effective getaway to our capacity to become change agents of the future--in business, work, play, and relationships. Finding our presence is finding the key to creative change and to our own future." "Presence is remarkable in at least three ways. First, the authors' work has extraordinary emotional, as well as intellectual impact; it continued to affect me long after my initial reading. Second, I found that the insights I gleaned from the work depended on what was happening around me. I suspect I will take away different messages each time I read it. Third, the authors somehow opened me to unexpected messages and opportunities in my own life. My reading of Presence coincided with many seemingly chance encounters that in very real and specific ways have been essential to my own work, helping me find new ways to connect with colleagues, customers, and the larger community." --Darcy Winslow, General Manager, Global Women's Footwear, Apparel, Equipment, Nike, Inc.
Peter Senge is a senior lecturer at the Massachusetts Institute of Technology, the founding chair of SoL, a renowned pioneer, theorist, and writer in the field of management innovation, and the author of the widely acclaimed book, The Fifth Discipline: The Art and Practice of the Learning Organization (Doubleday/Currency, 1990). C. Otto Scharmer is a lecturer at the MIT Sloan School of Management, a Visiting Professor at the Helsinki School of Economics, and international action researcher, and author of the forthcoming book Theory U: Leading from the Emerging Future. Joseph Jaworski is the chairman of Generon Consulting, cofounder of the Global Leadership Initiative, and author of the critically acclaimed Synchronicity: The Inner Path of Leadership (Berrett-Koehler, 1996). Prior to her current role as director of the Johnson Presidential Library and Museum, Betty Sue Flowers was a professor of English at the University of Texas at Austin and an international business consultant. SoL (The Society for Organizational Learning, Inc.), an outgrowth of the former MIT Center for Organizational Learning, is a nonprofit international membership organization that connects researchers, organizations, and consultants in over thirty countries in building knowledge for systemic change. A portion of the net proceeds from SoL publishing sales are reinvested in basic research, applied learning projects, and building a global network of learning communities.